Good guitar lesson yesterday – still stumbling through the tricky bits of the Tarrega, but if I practise a bit more I should get it now. And the puppy here? 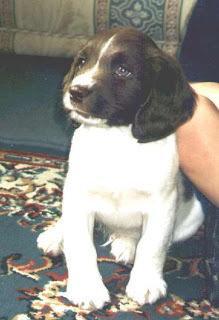 That was Byron in August 2002, when he was eight weeks old. I’m a bit twitchy at the moment because he needs to have a couple of teeth out next week. Given that he has a slight heart murmur, I’m not entirely happy about him having an anaesthetic; but I don’t want him to be in pain, either, so we have to take the risk and the vet thinks all will be well. Needless to say, you will not get much sense out of me next Tuesday. I find having a dogless house really hard. The day before or after a holiday is always horrible. So keep me distracted by answering a question: as a reader or a writer, do you like pets as secondaries or loathe them - and why? Pets are such a good prop! I can think of loads of reasons for using pets (horses included)within novels. They present huge possibilities just for opening sequences within novels, tragic or otherwise and can be a source of immediate conflict. I'm going to go away now before I start writing an opening scene. I love dogs! Just thinking that I still haven’t written about them in a tale of mine… will have to! Currently I’m writing about a cat even if it’s a secondary but important character. Dogs and cats are astonishing at interact as well as people – in books or in real life. Loved dogs even more after the vision of Lasse Hallstrom’s “Hachiko” featuring Richard Gere – a story of a never ending friendship between a man and a dog. Curious how the name “Hachiko” means two different things in Japanese: little dog and “Hachi” also means eight. As a matter of fact Hachiko (in the film) wears a wooden medal around its neck in which you can see the Japanese number eight. How I’d love to speak Japanese - I was undecided at University between Japanese and Russian – at last I picked the second one and it was an excellent choice! As your partner in crime before now, you know already that as both reader and writer, I adore animals in books! Agree completely re Jennifer Crusie. I'd also recommend Marcia Willett as wonderfully engaging Newfoundlands feature in many of her books. Knowing you had a fab dog of your own in the current continuity, I indulged in 2 kittens and an additional assortment of other animals courtesy of an inherited menagerie!! Looking forward to working with you again in future - and, who knows, Bramble may yet get her second litter of puppies!! I often have dogs and cats in my books, and as you know Animal Instincts had a whole load of them. Aww you just want to cuddle him! Michela - haven't seen the film, but it sounds interesting, and I love it when little details like that fit in so beautifully. And I'm in awe of your multicultural skills - Russian's far from an easy language to learn. Lacey - he loves cuddles. Not quite such a lapdog as our first spaniel was, but still very cuddly. What a gorgeous pic of Byron. My last dog had a heart murmur and it used to terrify me when she went to the vet. She was always fine. Shall be thinking of you! Shirley - thanks for the reassurance (am VERY twitchy right now). And yes, I recognised certain pets in yours!